Regular readers have been breathlessly waiting for over 3 years for the review from the veterinary research histopathologist of the latest recipes to be pulled out of the box for the Marguerite PotLuck Project. Yes, ladies and gents, it's time for stuffed haddock and biscuits (but not at the same time). Thus spoke the haddock (or hake), and he does have a point. I mean, this dish is not bad by any means, but you wonder what is so wrong with fish that ole Maggie feels she has to add bread crumbs, tomatoes, beans (beans ?) and nuts (nuts ?!?) to make it interesting. Recommended: If you feel like going back to the seventies for a night, but are too old for coke or too squeamish for key parties. Marguerite says the quantities are enough for 50-60 biscuts, but you're looking in the bowl and thinking: that's enough for 12 bloody cookies, that is. I also like how you've cleverly recreated the original photos - very artistic. I hope that the French Canadian pathologist with whom you live truly appreciates what a multi-talented catch you are! I agree with pinklea on the cookbook photo recreations. Your creativity seems to have no bounds, Monkey. You should go into marketing or something. It gets better and better. As for Coley. I am a fishmonger's daughter and Coley and Whiting are strictly for cats. The photos are brilliant. Looking forward to the next one already. Newsflash: the photographs are the work of the pathologist!!! I cook, he eats and photographs. What's not to like? We are calling it a "couples' activity" and then making puking noises. 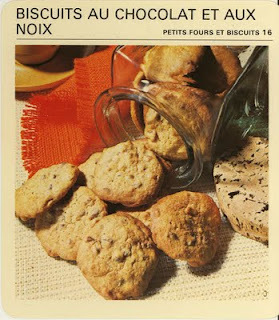 Well, if the recipes called for "noix" it's walnuts, so obviously you ruined it with your hazelnuts. Krazy Kitty, very interesting. Usually, if it's a walnut, a French recipe will say "noix de Grenoble" (Marguerite does it elsewhere) because, as I know you know, "noix" just means "nut" in French. Either way, it wasn't as disgusting as it sounds, walnuts or not. I was afraid the color grading in the original photos is biasing me. I look at it and think it would be quite irritating to make and probably fiddly and fussy and the result at the end wouldn't be worth it. But I like fiddling and fussing - well, I like chopping things finely with a very sharp knife [foodstuffs only, honest] and things so worried that the slightly off tones of the tomatoes were Spoiling It All. 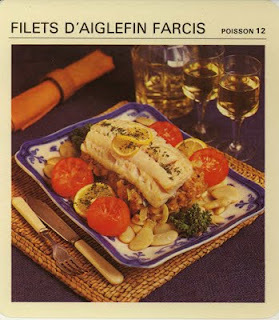 Now I realize that it's just subconscious sympathy for the haddock! I believe I'm ready to enjoy the rest of the series now. Those cookies look great. Got milk?